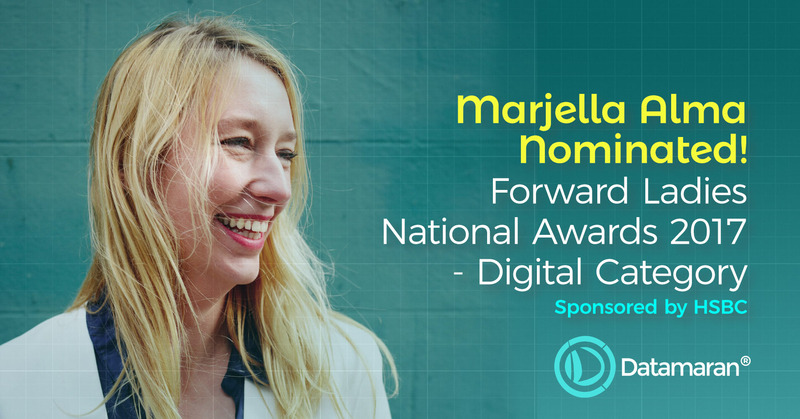 Datamaran’s CEO Marjella Alma is nominated for the Digital award in the Forward Ladies National Awards 2017 – the largest celebration of Women in Business. The award, sponsored by HSBC, is a well-deserved commendation of Alma’s leadership at Datamaran and within the wider non-financial business community. Alma co-founded Datamaran in 2014 as CEO. In that time, Datamaran has grown rapidly. At present, Datamaran serves corporate customers, consultants, and investors all over the world. To serve this client base, Datamaran has opened offices in the U.K, the Netherlands, Spain, India, Luxembourg and on the east and west coast of the US. Alma’s professional development has also grown alongside Datamaran. In 2016, Alma was invited to join Telefonica’s Sustainability Advisory Panel. This independent senior executive committee aims to develop Telefonica’s strategy, seeking solutions like Datamaran to help flourish in a rapidly evolving landscape. "It is always flattering to be nominated for awards. The most pleasing about the Forward Ladies Awards is that it puts a spotlight on female leaders. In the U.K. and further afield, there is some excellent work being done and I'm delighted to represent Datamaran in the Digital category"
“This has been a fantastic year for women and now it’s time to change gear and focus on the support needed to nurture talent regardless of gender, sector or region. The award categories are a reflection not only of the types of businesses with which women are involved, but also those which showcase the underrepresented women working in traditionally male dominated fields such as Science, Technology, Engineering andMathematics (STEM), Digital and Online industries." To hear more from Marjella, you are able to follow her on Twitter or LinkedIn.